KRYOLAN MAY PERIODICALLY AND IN ITS SOLE DISCRETION MODIFY THIS POLICY. IF KRYOLAN MATERIALLY CHANGES THIS POLICY, A NOTICE WILL BE POSTED ON THE WEBSITE, ALONG WITH THE UPDATED POLICY, AND THE “LAST UPDATED” DATE ABOVE WILL BE MODIFIED. YOUR CONTINUED USE OF THE WEBSITE MEANS THAT YOU ACCEPT THE UPDATED POLICY. UNLESS WE PROVIDE YOU WITH SPECIFIC NOTICE, NO CHANGES TO OUR POLICY WILL APPLY RETROACTIVELY. 1. 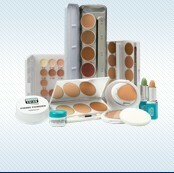 What Information Does Kryolan Collect and Store? Volunteer personal information to us in any other manner. Collection of Personal Information From or Through Social Media Sites or Using Your Social Media Login. When you interact with any Kryolan page or account on a social media platform, such as Facebook, Twitter, Google+, Tumblr, LinkedIn, YouTube, or Pinterest, we may collect the personal information that you make available to us on that page or account including your account ID or “handle.” However, we will comply with the privacy policies of the corresponding social media platform and we will only collect and store such personal information that we are permitted to collect by these social media platforms. If you choose to link or login to your Kryolan account with or through a social networking service, Kryolan and that service may share certain information about you and your activities, including your IP Address and that you have visited our Website. With your consent, we also may share information about your activities, including what you view on the Website, with that social network’s users. We may collect and store your Device’s source IP address, which may disclose the location of your Device at the time you access the Website. Advertisements and certain content may be directed to you as a result of this data. In addition, in some cases the Website can deliver content based on your current location if you choose to enable that feature. If you enable that feature, your current location will be stored to serve you certain content tied to your location. If you elect to have your location-based searches saved to your history, we will store such information on our servers. We also may collect and store information about you that we receive from other sources (including our offline interactions with you), to, among other things, enable us to update and correct the information contained in our database and to better customize your experience on the Website. 2. Is Personal Information Collected From Children? Our Website is not directed to children under the age of 13, and we do not knowingly collect Personal Information from children under 13 years old. If you are under 13 years old, you should not use this Website, and under no circumstances should you send information about yourself to us without providing us with consent from your parents or legal guardian. If we become aware that we have received personal information from a visitor under the age of 13 on the site and we do not have parental consent or legal guardian consent, we will delete the information from our records. 3. How Does Kryolan Use Personal and Non-Personal Information? Perform statistical, demographic, and marketing analyses of users of the Website. Perform statistical, demographic, and marketing analysis of users of the Website. We may use the information from one portion of the Website in other portions of the Website, and we may combine information gathered from multiple portions of the Website into a single customer record. We may also use or combine information that we collect off-line or that we receive from third party sources to enhance, expand, and check the accuracy of your customer records. 4. When Does Kryolan Disclose Your Information? We have third party agents, subsidiaries, affiliates and partners that perform functions on our behalf, such as hosting, billing, content syndication, content management tools, social media integration, marketing, analytics, customer service, fraud protection, etc. These entities have access to the Personal Information needed to perform their functions and are contractually obligated to maintain the confidentiality and security of that Personal Information. They are restricted from using, selling, distributing or altering this data in any way other than to provide the requested services to the Website. We may also use or disclose Personal Information if required to do so by law or in the good-faith belief that such action is necessary to (a) conform to applicable law or comply with legal process served on us or the Website; (b) protect and defend our rights or property, the Website or our users; and (c) act under emergency circumstances to protect the personal safety of us, our affiliates, agents, or the users of the Website or the public. We may disclose or share Non-Personal Information (or other information, other than Personal Information) in any other manner that we deem appropriate or necessary. Among other things, we will disclose Non-Personal Information to third parties to help us determine how people use parts of the Website and how to improve our Website. We will also disclose Non-Personal Information to our partners and other third parties about how our users collectively use the Website. Personal data provided within the context of an order or as part of our other service offerings are protected by technical security systems and additional authorization procedures. While we use reasonable efforts to safeguard the confidentiality of your information, we are not liable for disclosure of any information due to errors in transmission or the unauthorized acts of third parties. No data storage system or transmission method is guaranteed to be 100% secure, and as a result, we cannot guarantee the security of any information you may supply. If Kryolan learns of a security breach, we may attempt to notify you so that you can take appropriate protective steps. You promise to: (a) provide true, accurate, current and complete information about yourself as prompted by the Website’s registration form (such information being the “Registration Data”) and (b) maintain and promptly update the Registration Data to keep it true, accurate, current and complete. If you provide any information that is untrue, inaccurate, not current or incomplete, or Kryolan has reasonable grounds to suspect that such information is untrue, inaccurate, not current or incomplete, Kryolan has the right to suspend or terminate your account and refuse any and all current or future use of the Website (or any portion thereof). You are entirely responsible for the security and confidentiality of your password and account. Furthermore, you are entirely responsible for any and all activities that occur under your account. We may transfer the Personal Information we collect to countries other than the country in which you are located. Those countries may not have the same data protection laws as the country in which you initially provided the information, and by voluntarily submitting Personal Information to us, you thereby consent to the transfer of that information to, and / or storage of that information in, the United States. You always may opt-out of receiving future e-mail messages and newsletters. Kryolan provides you with the opportunity to opt-out of receiving communications from us at the point where we request information about you. To remove your Personal Information from our database, to not receive future communications or to no longer receive services from us, send an e-mail to webshop-usa@kryolan.com with the word “remove” in the subject line. Kryolan also permits you to correct or update Personal Information that you have previously provided to us. To do so, send e-mail to: webshop-usa@kryolan.com indicating the information that you wish to be corrected or updated. California Civil Code Section 1798.83 permits customers of Kryolan who are California residents to request certain information regarding Kryolan’s disclosure of their Personal Information to third parties for their direct marketing purposes. To make such a request, please send an e-mail to webshop-usa@kryolan.com.